Sunday school classes in 1925 ??? Lake Nokomis Lutheran Church was founded in 1912 as Bethesda English Lutheran Church, though its roots go back to 1907 when layman Joachim M. Anfinsen, residing at 50th Street and Woodlawn Boulevard (near the shores of what was then Lake Amelia and what is now known as Lake Nokomis), noted that children in the community had no Sunday church school to go to and proceeded to open his home each Sunday for Christian education classes. Anfinsen, who had a large family of his own, asked the United Lutheran Theological Seminary in St. Paul (now Luther Seminary) for a couple of seminarians to assist with starting the school. Because Anfinsen was a member of Bethlehem Lutheran Church, now at Lyndale Avenue and 41st Street, the original assistance and funding came from that source, as well as the eventual synodical connection with the United Norwegian Lutheran Church. After meeting for some months in Anfinsen’s home, the group was offered a vacant farm house located at 28th Avenue South and Minnehaha Creek. Thereafter the Sunday School and occasional worship services were conducted there. In 1908, Bethlehem Lutheran came to the assistance of the group and advanced funds enabling them to buy a lot and build a chapel at 29th Avenue South and 49th Street. The congregation was formally organized on February 4, 1912, with the Rev. Lyle Halvorsen called to serve as its pastor, dividing his time between Bethesda and Nazareth Lutheran, another mission congregation. The congregation moved to its present location in 1920. The Minnesota Baptist Conference owned the lot at the corner of 31st Avenue South and 50th Street at the time and had intended to start a mission here, but they found very few Baptists in the community and offered to relinquish the property to the Lutherans. In January of 1922, the congregation broke ground for the first unit of a new church building, a sub-auditorium seating over 300 people. Later the old chapel was moved to the 31st Avenue address also, alongside the new facility where it was used for Sunday School and social purposes. With congregational growth in the post-World War II years, crowding was a problem, especially in the Sunday School, and so the current education building was erected in 1952. The original little chapel was razed to make room for the structure. By 1962, when construction on the current sanctuary began, membership stood at 2,146. 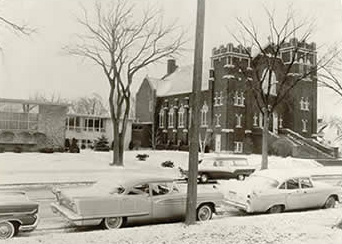 The education wing and church were linked in 1974 by a new building providing space for the church offices, a library on the ground level, an all-purpose meeting room (later named the Bethel Room) and a two-story gymnasium.